"We had to get Jason back. This time it was rats in the roof. This time it was our rental in Green Bay. The whole thing only took about half an hour. Jason was up round the roof and out. No noises yet from the roof. Our visitors seem to be gone! Great service, very happy. " "Jason arrived within a couple of hours of me phoning about a wasps’ nest being built in our carport. He removed it and treated the area. He said if the wasps hadn’t gone in the next couple of days he would re-treat at no extra cost. We haven’t had any problems since. Would definitely recommend." "We had an in ground German wasp nest at our Henderson home. The pest technician came and sorted it for us really quickly. He got to us within half an hour too, I think he just happened to be near by in Glendene. They had eftpos so it was super quick. We weren't too sure if it was bees as we couldn't get near enough to see if it was actually a hive. Apparently if it was a swarm of bees then removal would have been free. " "Jason responded promptly to my request for a wasp nest to be removed. Professional and friendly. Fee slightly lower than a couple of other quotes. Highly recommended." "Jason carried out a borer treatment for our sub floor. We were happy with both with Jason and the treatment. Would recommend. " "Prompt and friendly service. No sooner had I sent a request through his website than he on the phone to me to discuss the bees in my yard that actually turned out to be wasps. He was fast in exterminating their underground nest the next morning and soldiered on despite getting stung on the ankle. And now I can go out on my deck without fear again. Good work! " "We are very happy with the commercial service that's been set up for us. Jason's program has sorted the rodents and they haven't been back. We will use him for all our pest control needs going forward. " "Rats in the roof were dealt too swiftly. Nice guy, prompt service. Would use again. " "We had a great experience with Jason from Abolish and am happy to recommend him. He was prompt, responsive, and had great communication. He came to a call out, between Christmas and New Years, to remove a wasps nest. He made sure they were wasps, not bees, and was pleasant and effective. " "Great service! Jason is thorough and easy to communicate with. We have a HACCP monitored pest control program in place and it is followed accordingly and correctly. 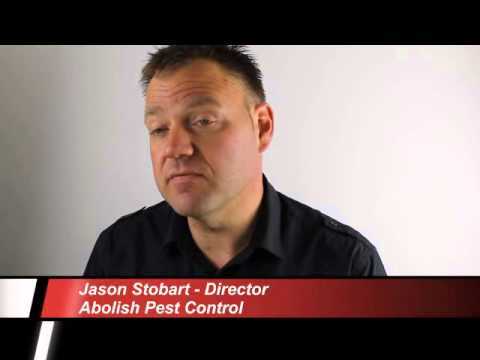 We have never had any issues and Jason has gone the extra step to research particular pest concerns." "Great job, very professional and clearly an expert in his field. We had rats in our roof between a sark ceiling and the outdoor sheeting so were very worried about having to have part of the roof removed to deal with the problem. Jason managed to find a way of getting bait in the roof space which avoided any damage. The rats were gone within a couple of days and never returned. Jason also walked round our property and showed us things we could change to stop the rats gaining access again which… was really useful. We have since used him again for house spraying and preventative baiting as we were so impressed and he also manages the pest control in our business premises now." "Great service and always obliging"
"Thank you Abolsh Pest Control. This is the 2nd time I have dealt with Jason who I found on both occasions to be punctual, competent & efficient in his work. He explains everything to me in a way that I can understand & suggested ways how I could prevent future infestations..Thank you Jason. I will definitely be using Abolish Pest Control again for any future work.. Highly recommended!" "Jason has been attending to our pest and insect control needs at the NZ Police Centennial Trust holiday home complex on Hibiscus Coast for a number of years now, and we can only rate him as excellent in all respects. Scheduled service visits are timely, information on chemicals used is fully compliant with HAZNO legislation, and his advice on pest control matters is well-informed and current with developing technology. Through his service we have managed to maintain pest-free accommodation on… site. Highly recommend to all requiring this service." "Jason cleared out a german wasp nest without destroying our hedge. This made it more difficult for him to access the nest, but he guaranteed the work anyway, and offered to come back if it was unsuccessful and we did need to cut into the hedge. Much appreciated - good communication and good result." "Excellent company to deal with. Jason is lovely and the price he quotes is very competitive. Excellent service. Would have no hesitation is recommending him to anyone wanting effective pest control. "Great service- reliable, efficient and friendly. Jason did a great job getting rid of both a large wasp nest and putting some mice/rat bait down. Would highly recomment for a professional and reasonalby priced job. He was here within 24 hours of my call which was greatly appreciated." We offer both domestic and commercial pest control throughout the greater Auckland region. Our programs protect customers who represent many of Auckland's most trusted and iconic brands. We offer domestic services for most pests as well. All of our services focus on keeping you safe while eliminating your pest in the most effective manner possible. It may be a the smallest wasp nest that needs eradication or a large food manufacturing plant which needs a comprehensive program, we cater for all needs so give us a call.